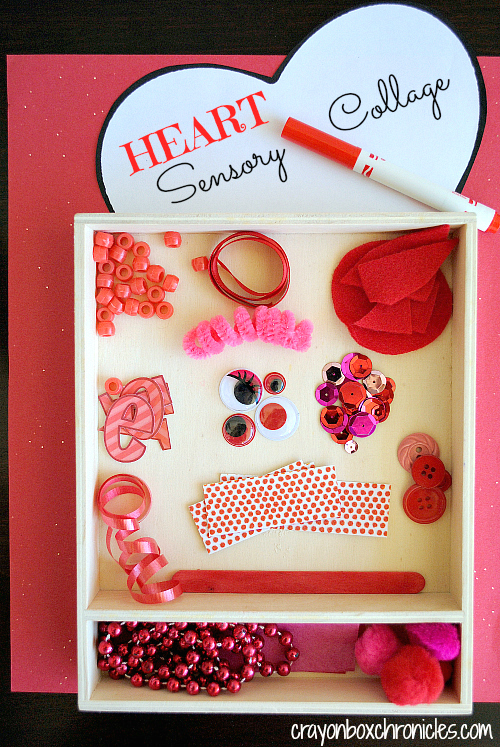 Today’s heart sensory collage explores tactile sensations, cutting, and fine motor skills. 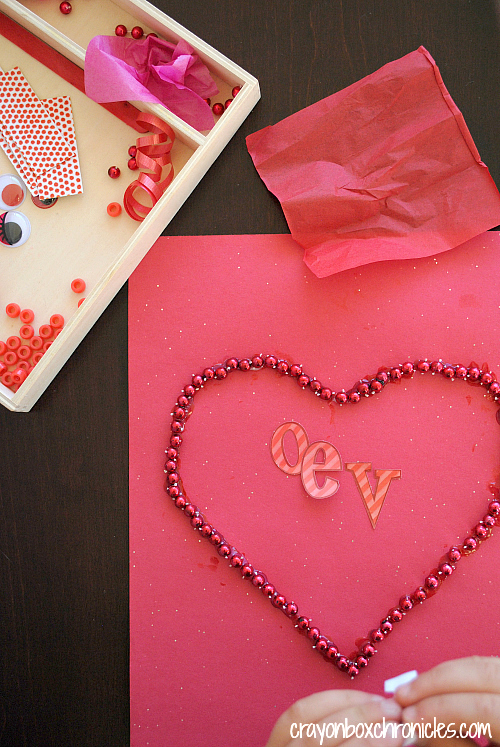 With Valentine’s Day right around the corner, this seemed like a great opportunity to create with red materials. This child-led activity give C a chance to explore materials he collected with minimal instruction from me. Have your child collect red objects in various textures, sizes, shapes, and shades. C gravitated to varying shades of red and magenta. He chose pom-poms, beads, tissue paper, popsicle sticks, colored goggle-eyes, buttons, felt, string, sequins, letters, textured paper, and a beaded necklace. After he collected his loose materials, I arranged them inside a wooden tray in a visually stimulating way. 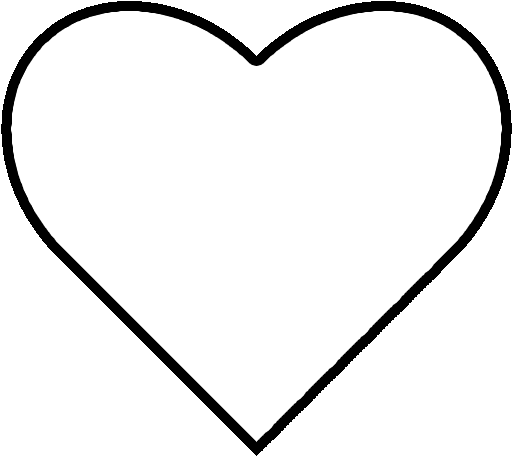 Print out the heart template, then cut it out. I cleaned up his cut before he began. 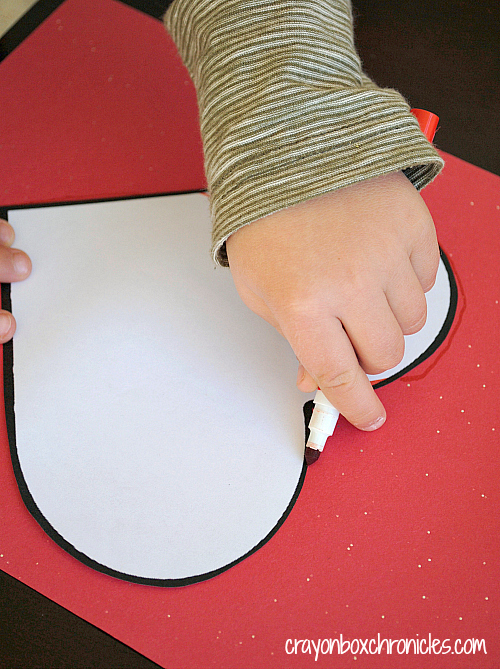 Next, trace the heart template on the paper. After my cutting and tracing support, he began exploring the materials he chose, with no specific set of directions or purpose. 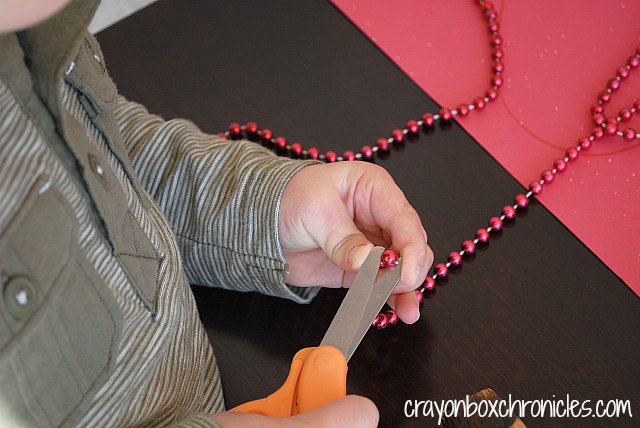 He immediately grabbed the beaded necklace and began cutting – great for those much-needed preschool cutting skills. As I was watching him, I immediately thought of Racheous activity Montessori Golden Beads. She has lots of great Montessori inspired activities on her site. This sensory experience was simple, fun and educational. He kept saying, “Look! It’s a heart Mommy!” He continued to explore all the parts. I wasn’t sure if he would use the glue or just play with the parts. 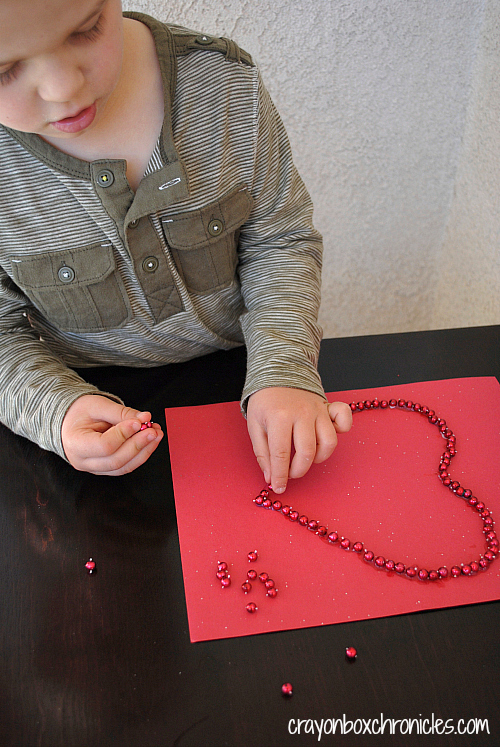 After cutting most of the beads, he began gluing them, outlining the heart. This alone kept him happy and focused for 15 minutes! That’s long in preschool land. I will definitely be doing more bead activities with him in the future. Once he finished his outline, he began exploring all the different textures and colors of the materials. He started with the letters and textured paper, moving them all around the paper. It was interesting to see what his intentions where with the materials. He began commenting on how they felt. We continued to discuss ways to explore the items. Are they soft? What shapes do you see? Bigger and smaller differences? Once he decided he’d like to glue them, I helped him at his request. We used school glue and tacky glue for the large pieces. After it dried, we hung it on his art wall for easy access to explore. 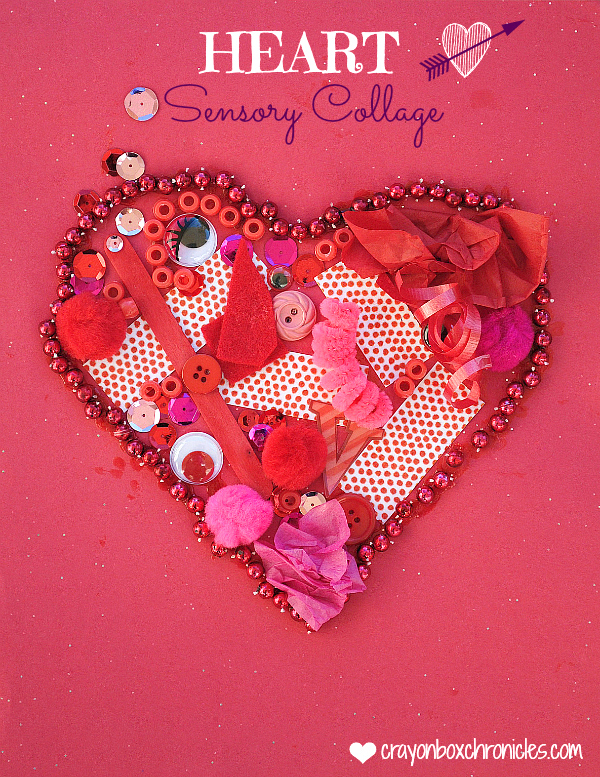 This multi-sensory collage makes a sweet Valentine’s card too. Don’t forget to add a message to your dear Valentine. Oh, I like how it turned out! Thank you for sharing at Sharing Saturday! thanks Carrie! And thank you for hosting. This is such a cute holiday craft. I love all of the materials and the fine motor practice. Thanks so much for linking up at Discover & Explore. I’m featuring this post today. 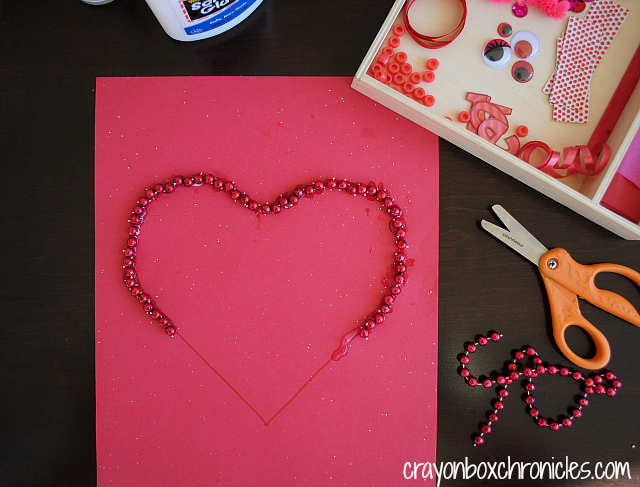 Pingback: Heart Art for Kids - 20 Valentine's Day Art Projects - Fun-A-Day! What a great idea – I’m raiding my crafts supplies, costume jewellery and going to set up this for later in the week. Hi Cerys. Thank you! I really appreciate the feature too. Thanks for hosting too. My grandsons had Montessori schooling and I love the toys associated with their branding. Have your kids tried Cup Stacking? I did a post on my almost 2 year old grandson learning how to stack them and then knock them over. It kept him busy for hours, just like his cousins. Awww this is an adorable idea and love how once again you are using those fine motor skills. Thanks for sharing. Love this idea! My boys love sensory play.